This New Book Club Lets You Meet People & Read So Much More! The Nook is a moving film and book club that comes together once a month to share and discuss authors, directors, their favourite literature and cinema. Changing locations, focus on particular themes rather than a single book or film, super-friendly members. 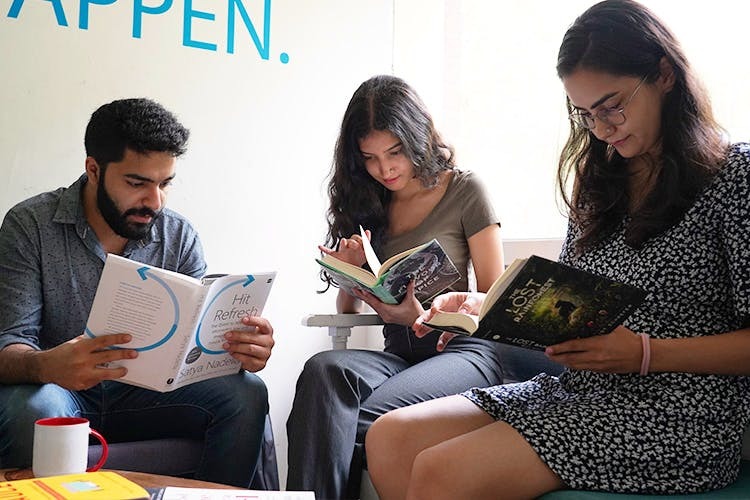 After Jayesha moved back to India from Nairobi where she was part of diligent book club, she decided she wanted to encourage people around her, friends and acquaintances, to read more and more. If there's one thing we can all agree on, it's how little time we all manage to dedicate to reading. So she came up with The Nook, putting a spin on traditional book club rules where you all decide on one book/film to discuss. Instead, she decided to be more flexible and stick to a particular theme. So you can discuss different authors, the book(s) you read or the film you saw, and it turns into multiple topics (rather than focusing on a single piece of work). They even do movie screenings, depending on their location. They usually meet in the first week of every month, giving you plenty of time to explore the decided theme. They meet in different locations, sometimes at cafes where you can play boardgames, have some nice coffee and just indulge in some quality conversation, or peoples' homes. You can ask to join their Facebook group to keep updated about their meetings. They've just started out, so it might be too early to tell.